Megamind is a surprisingly sharp spoof of the superhero genre. Megamind is a big-headed blue guy whose imagination never really lives up to his self-given name. He was born on a planet that was about to explode and, at the tender age of 8 days, he was placed in a spacerocket by his parental units and given a minion (a fish in a fishbowl) to look after him and be his companion. As fate would have it, another nearby planet was experiencing its own elimination and another toddler was sent spacebound. Foreshadowing a lifetime of conflict, the toddlers raced to planet Earth, a fateful ricochet sending the blue baby into a prison for the curiously gifted, where inmates took the toddler in as one of their own and raised him in the ways of the ‘hood. The white baby wound up landing in the living room of an upper-crust mansion, right under the Christmas tree. Needless to say, the blue boy was destined to be a super villain voiced by Will Ferrell (Blades of Glory). The white kid turned into a really super man named Metro Man (Brad Pitt, The Curious Case of Benjamin Button). But, while Megamind thought his life was rough while constantly battling Metro Man, he also finds out life is too easy, too bland without his arch enemy in the picture. 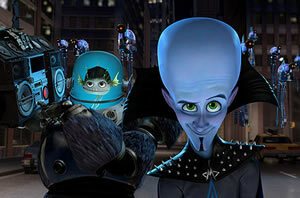 Megamind is told from the villain’s point of view because, hey, being evil is more fun... or at least more interesting. That’s been a long-standing criticism of the traditional tellings of such mainstays as Batman and Superman. Their enemies are more colorful, more outrageous. To that end, even Superman clone Metro Man has become bored with his super superhero status. This past summer, Despicable Me spoofed the James Bond villains. This one spoofs the comic book heroes and villains. And, much like the former, the latter works thanks to a lot of tender loving care given to the characters and the story. Plenty of super staples are picked on and tossed around, such as all those villainous traps and plots that consistently leave the villain a dollar short and the hero a step ahead. And another familiar device in the comics realm takes the form of Roxanne Ritchi (Tina Fey, Mean Girls), whose double-“R” initials hark back to characters names through the ages, including Lois Lane, Lana Lang, Bruce Banner, and Peter Parker. But even more obviously, at one point Megamind poses as the father of another off-kilter character named Tighten (Jonah Hill, How to Train Your Dragon). The father figure is clearly a play on Marlon Brando’s iconic portrayal of Superman’s silver-haired father, Jor-El, along with a dollop of the Godfather. Modern sensibilities run rampant in Megamind. But there is a curious element in all this: the choice of classic pop and rock songs to accompany the action. There’s a funny little mash-up of Minnie Riperton’s Lovin’ You and AC/DC’s Highway to Hell. But why didn’t they use a Katy Perry tune and maybe a Green Day anthem? Could it be simply a play to keep the parental units in the audience entertained? Such a lack of faith in the material – and contemporary music – is unwarranted. There’s quite a dynamo of talent involved in the production, including creative advisors Guillermo Del Toro (Hell Boy) and Justin Theroux, Iron Man 2’s scribe and collaborator with Ben Stiller, one of Megamind’s executive producers. Theroux and Stiller also lend their voices to the endeavor.